Highly configurable eight-channel audio processor for all broadcast applications: base unit offers AES3 I/O and multichannel true peak limiting; numerous other options –including loudness management, dynamic range control and monitoring functions – may be added as needed by software license to suit individual requirements. Hardware modules are also available to add additional I/O capability (including SDI) and various Dolby® encode/decode options. The Jünger D*AP4 FLX digital audio processor is a 4-channel version of the D*AP8 FLX which offers most of the functionality of the D*AP8 FLX across a reduced channel count. The D*AP8 FLX is part of Jünger’s D*AP processing platform concept: the base unit is an eight-channel processor with extensive GUI control via a web browser. The unit is primarily intended for use in broadcast environments where digital audio is standard, with four AES3id inputs and four AES3id outputs. True Peak Limiting is provided as standard. Additional I/O connectivity may be added in the form of optional cards which plug into two rear panel expansion slots. The control system permits any input and output to be routed to/from the internal DSP as required. The range includes an SDI I/O card which caters for SD, HD and 3G formats and is compliant with SMPTE 424/425M, 292M and 259M. The D*AP8 FLX can de-embed the 16 channels of audio and any eight channels can be routed internally to the audio processing section. De-embedded channels may also be routed to the unit’s AES3 outputs to feed external equipment. The SDI I/O module also supports embedding, allowing signals from elsewhere in the unit’s architecture to be inserted into the SDI stream for onward transmission. The outgoing SDI video can be delayed to compensate for internal audio processing. The D*AP8 FLX’s standard AES connectivity can be increased by adding further AES I/O cards. These provide eight additional input and output channels (4 x AES3 in each direction), via a 25-way Dsub connector. The base unit and all the optional I/O cards feature automatic hard relay bypass, ensuring signal continuity in the event of PSU failure. The D*AP8 FLX is ideal for working in 5.1 and other surround sound formats: Dolby® encoded programme may be catered for by the addition of optional, internally-fitted Dolby® modules. Three modules are available: the decoder option accepts material in Dolby® E, Dolby® Digital, Dolby® Digital Plus and Dolby® ProLogic II formats from any pair of input channels; the discrete outputs may similarly be routed to any outputs. A Dolby® E encoder module performs the reverse process, while a third module encodes separate surround channels into AC or AAC/HE-AAC formats, allowing Dolby® Digital or Dolby® Digital Plus output streams to be generated. The unit may be fitted with a decoder, an encoder or one of each. Users can customise the D*AP8 FLX for their particular application by specifying which processing options are to be enabled. This is done by software license so additional features can be added at a later date if needed with no hardware modifications. Jünger’s Level Magic II™ addresses the common problem of significant – and often disturbing – changes of loudness occurring when switching between programme sources, particularly during unattended operation. The algorithm ensures that program levels remain within predetermined tolerances without any colouration, pumping, breathing, distortion or modulation artefacts, no matter what the programme source is. Level Magic II™ is compliant with all current broadcast audio loudness recommendations including ITU-BS.1770, ATSC A/85 (2011/ 2013), ARIB TR-B32 Free TV OP-59, Portaria 354 and EBU R128. 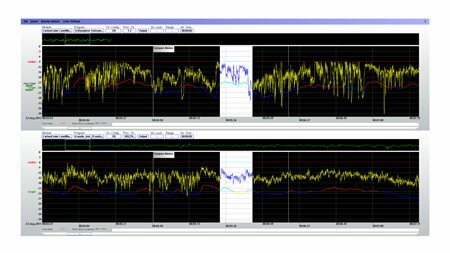 LoudnessLogger™ can be added if a record needs to be maintained of broadcast loudness levels. Flexible control of audio dynamic range is possible with the addition of the compressor/expander option. Jünger’s Spectral Signature™ is a dynamic filtering technique which permits the operator to analyse a known sample of programme which is used as a “reference”. The algorithm adjusts the spectral content and dynamic range of all programme material to match this reference as closely as possible, ensuring that all audio output has a similar sonic character. Other software options include 5.1 Upmix and stereo Downmix generation); this is combined with a Fail Over function, which automatically switches the input to a nominated secondary input in the event of input signal failure. The Voice Over option uses a second input to trigger audio ducking. On the base unit, primary unit settings and level metering are provided on the front panel, however, full unit configuration and control is available from anywhere in a user’s facility through a comprehensive set of web pages; to which access may be restricted with passwords. Network control using Ember+ is also implemented, allowing the unit to be controlled or scheduled by VSM or similar facility-wide systems. If dedicated hardware controls are preferred, the optional X*AP RM1 remote control panel may be purchased; this can control multiple units, including others from the Jünger range, and includes multicolour bargraph meters, OLED graphic displays and programmable hotkeys. The 8-way GPIO port allows the unit to be interfaced to almost any other control equipment for basic signalisation and commands. The D*AP8 FLX is a 1U rack-mounting unit with dual, internal redundant PSUs as standard (with separate IEC inlets and AC switches).